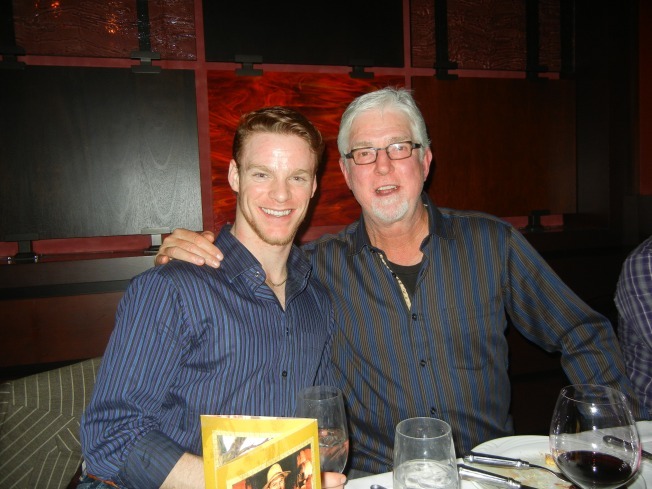 Giants Broadcaster Mike Krukow's Son Turned Him Into "Ballet Groupie"
Weston Krukow (left) sits with his father, San Francisco Giants broadcaster Mike Krukow in unknown restaurant. The son of San Francisco Giants broadcaster Mike Krukow is following in his father’s athletic footsteps… in ballet shoes. Weston Krukow, the youngest of the five Krukow siblings, recently became one of just eight male dancers in San Francisco’s prestigious Smuin Ballet. That one of the most famous voices in Bay Area baseball has a son who quit Little League for the big stage is just fine with the elder Krukow. There’s no question the youngest Krukow is an athlete; one look at his muscular physique wipes any doubt from the mind. And although there’s certainly a difference between performing a pirouette and pitching, in dad's eyes, ballet and baseball might be more similar than they appear. Despite going in different directions athletically, Weston will always be a Giants fan, and his dad will continue to attend as many ballet performances as possible.